I’m 5’7”, which is pretty tall, but do you want to know what’s even taller? Bubblegum Alley in San Luis Obispo! Standing 15’ high and 70’ long, this sticky, yet fascinating attraction in San Luis Obispo is 12.5x my height if you stretch its length. An incredible and simultaneously disgusting site to see, Bubblegum Alley is located in the heart of Downtown San Luis Obispo on Higuera Street between Garden Street and Broad Street. 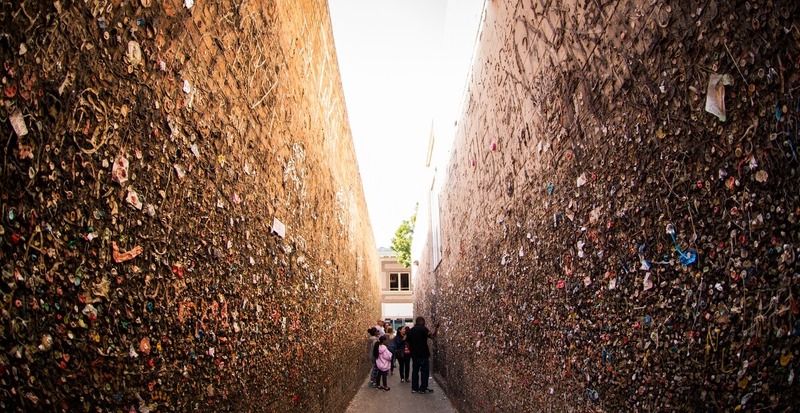 Wowing visitors, the alley is the only bubblegum wall in existence in California, rivaling only Seattle, Washington’s recently cleaned version. The alley has become so famous, in fact, that it has been highlighted on The Tonight Show, PBS, MTV, the San Francisco Chronicle, The Guardian, the LA Times, and many others! Visitors and locals alike are encouraged to contribute to the wall – that is, if there’s room in the bustling alley. So how did this peculiar landmark come to be? That’s a good – and highly debated – question. Some historians and long-time locals believe that the wall was created from a rivalry between San Luis Obispo High School students and Cal Poly students in the late 1950s while the rest claim that it was created just after WWII as a SLO High graduating class event. The alley has been thoroughly cleaned twice since its inception in the 1970’s, but when shopkeepers asked for a third cleaning in 1996, they were turned down. While the true story of the alley’s history is unclear, this landmark is a must for anyone looking to hit all the bucket list stops in San Luis Obispo. My first experience at Bubblegum Alley was full of many different reactions. At first, I was repulsed by the bacteria filled walls – finding the alley to be the absolute worst form of graffiti – but as I walked down the alley, I began to see art in the form of gum drawings, political statements, and Polaroids stuck to the walls with gum. By the time I had completed my tour of the alley, I realized that this repulsive alleyway was simultaneously beautiful, artistic, and full of stories. Inspired, I chewed up a piece of gum, and left my mark. I encourage all visitors to experience Bubblegum Alley, leave a piece of gum on its walls, and snap a few photos before continuing on. Be sure to use #ShareSLO for the chance to be featured on ShareSLO’s social channels, too. I’d also encourage visitors to really explore the alley because oftentimes you’ll find hidden messages and artwork made from gum! While visiting is free, you may want to pop into a nearby shop and buy a gumball or two from one of the machines. As gross as it is, you must admit that it is an incredible piece of San Luis Obispo culture and history that you just shouldn’t pass up.